As the head of Axiata Analytics Center, Pedro Uria-Recio leads advanced analytics across the operational companies of Axiata Group, a telecom and digital conglomerate in 10 Asian countries. Pedro focuses on artificial intelligence, growth hacking, digital applications, robotic process automation and network analytics. Prior to Axiata, Pedro was a management consultant specialising in strategy, marketing, telecom and technology at McKinsey & Company based in Kuala Lumpur and in Santiago, Chile. Pedro also worked in IT strategy and architecture in Veolia in Hong Kong, and in Research and Development in France Telecom in Paris. 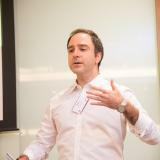 Pedro holds an MBA from the University of Chicago School of Business and a BsC in engineering in Spain.